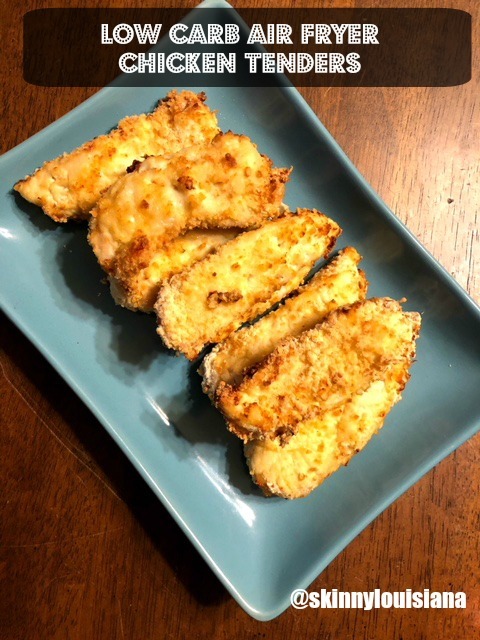 4-ingredients is all you need for these low-carb crispy chicken tenders! Have I told you all how much I love my Phillips Air Fryer? Not only is the Air Fryer easy to use and requires little clean up, it allows me to enjoy my love of fried foods without the fat and carbs. My latest creation, low-carb chicken tenders, stars an amazing new flour, Wio Smart Flour. This flour is all-purpose and low net carb taking our traditional recipe from high-carb to low-carb without losing any flavor. We got rid of the traditional flour and breadcrumbs and replaced with a combination of Wio Smart Flour, Parmesan cheese, and Panko bread crumbs. Don’t have Wio Smart Flour? Use can crush PLAIN Fiber One cereal in its place. In a separate medium bowl, combine Wio Smart Flour, parmesan cheese, and Panko bread crumbs. Spray Air Fryer wire rack with non-stick cooking spray. Dip each individual chicken tender into egg mixture, flour mixture, and place on wire rack in Air Fryer. Spray tenders with non-stick cooking spray. Open tray and flip each tender. Spray with non-stick cooking spray. *If Wio Smart Flour is not available, use crushed Fiber One cereal. **We used a Phillips Air Fryer. Be sure to adjust cook time to your individual air fryer. Nutrition Facts: Calories: 190, Total fat: 6 g, Saturated fat: 2 g, Total carbohydrate: 3 grams.